New reaction scheme is suggested for the initiated nonbranched-chain addition of hydrogen atoms to the multiple bond of the molecular oxygen. The scheme includes the addition reaction of the hydroperoxyl free radical to the oxygen molecule to form the hydrotetraoxyl free radical which is relatively low-reactive and inhibits the chain process by shortening of the kinetic chain length. This reaction competes with chain propagation reactions through a hydrogen atom. Based on the proposed scheme rate equations (containing one to three parameters to be determined directly) are deduced using quasi-steady-state treatment. The kinetic description with use the obtained rate equations is applied to the γ-induced nonbranched-chain process of the free-radical oxidation of hydrogen dissolved in water containing different amounts of oxygen at 296 K. The ratio of rate constants of competing reactions and the rate constant of the addition reaction to the molecular oxygen are defined. In this process the oxygen with the increase of its concentration begins to act as an oxidation auto inhibitor (or an antioxidant), and the rate of hydrogen peroxide formation as a function of the dissolved oxygen concentration has a maximum. From the energetic standpoint possible nonchain pathways of the free-radical oxidation of hydrogen and the routes of ozone decay via the reaction with the hydroxyl free radical (including the addition yielding the hydrotetraoxyl free radical) in the Earth’s upper atmosphere were considered. The kinetics of inhibition for nonbranched-chain processes of saturated free-radical addition to the C=C and C=O double bonds of alkene and formaldehyde molecules, respectively, by low-reactive free radicals that can experience delocalization of the unpaired p-electron was first considered in . In these processes a low-reactive free radical is formed in the reaction competing with chain propagation reactions through a reactive free radical. In the present work the kinetics of inhibition by low-reactive hydrotetraoxyl free radical is considered for the nonbranched-chain process of the addition of a hydrogen atom to one of the two multiply bonded atoms of the oxygen molecule yielding a hydroperoxyl free radical. The hydroperoxyl free radical then abstracts the most labile atom from a molecule of the compound being oxidized or decomposes to turn into a molecule of an oxidation product. The only reaction that can compete with these two reactions at the chain evolution stage is the addition of the peroxyl radical to the oxygen molecule (provided that the oxygen concentration is sufficiently high). This reaction yields the secondary hydrotetraoxyl 1:2 adduct radical, which is the heaviest and the largest among the reactants. It is less reactive than the primary peroxyl 1:1 adduct radical and, as a consequence, does not participate in further chain propagation. At moderate temperatures, the reaction proceeds via a nonbranched-chain mechanism. The aim of this study was the mathematical simulation of oxidation process autoinhibited by oxygen, when the dependence of the peroxide formation rate on the dissolved oxygen concentration has a maximum. The simulation was based on experimental data obtained for γ-radiation-induced addition reaction of hydrogen atom to the molecular oxygen for which the initiation rate V1 is known (taking into account that V = GP and V1 = G(H•)P, where P is the dose rate, and G(H•) is the initial yield of the chain-carrier hydrogen atom H• - initiation yield [2,3]).Based on the reaction scheme suggested for the kinetic description of the addition process to oxygen, the kinetic equations with one to three parameters to be determined directly were derived. Reducing the number of unknown parameters in a kinetic equation will allow one to decrease the narrowness of the correlation of these parameters and to avoid a sharp buildup of the statistical error in the nonlinear estimation of these parameters in the case of a limited number of experimental data points. The rate constant of the addition to oxygen, estimated as a kinetic parameter, can be compared to its reference value if the latter is known. This provides a clear criterion to validate the mathematical description against experimental data. A number of experimental findings concerning the autoinhibiting effect of an increasing oxygen concentration at modest temperatures on hydrogen oxidation both in the gas phase [4-6] (Figure 1) and in the liquid phase  (Figure 2, curve 2), considered in my earlier works [8-11], can also be explained in terms of the competition kinetics of free radical addition [12,13]. From figure 1 shows that the quantum yields of hydrogen peroxide and water (of products of photochemical oxidation of hydrogen at atmospheric pressure and room temperature) are maximum in the region of small concentrations of oxygen in the hydrogen-oxygen system (curves 1 and 2, respectively) .In the familiar monograph “Chain Reactions” by Semenov , it is noted that raising the oxygen concentration when it is already sufficient usually slows down the oxidation process by shortening the chains. The existence of the upper (second) ignition limit in oxidation is due to chain termination in the bulk through triple collisions between an active species of the chain reaction and two oxygen molecules (at sufficiently high oxygen partial pressures). In the gas phase at atmospheric pressure, the number of triple collisions is roughly estimated to be 103 times smaller than the number of binary collisions (and the probability of a reaction taking place depends on the specificity of the action of the third particle) . Note that in the case of a gas-phase oxidation of hydrogen at low pressures of 25-77 Pа and a temperature of 77 К  when triple collisions are unlikely, the dependence of the rate of hydrogen peroxide formation on oxygen concentration (the rate of passing of molecular oxygen via the reaction tube) also has a pronounced maximum (see curves 3 and 4 in Figure 2) that indicates a chemical mechanism providing the appearance of a maximum (see reaction 4 of Scheme). The chain evolution (propagation and inhibition) stage of the Scheme includes consecutive reaction pairs 2-3 and 3-3'; the parallel (competing) reaction pair 3-4; and consecutive-parallel reactions 2 and 4. The hydroperoxyl free radical Ho.2 [23-25] resulting from reaction 2 possesses an increased energy due to the energy released the conversion of the О=О multiple bond into the НО-О• ordinary bond. Therefore, before its possible decomposition, it can interact with a hydrogen or oxygen molecule as the third body via parallel (competing) reactions 3 and 4, respectively. The hydroxyl radical НО• that appears and disappears in consecutive parallel reactions 3 (first variant) and 3 possesses additional energy owing to the exothermicity of the first variant of reaction 3, whose heat is distributed between the two products. As a consequence, this radical has a sufficiently high reactivity not to accumulate in the system during these reactions, whose rates are equal (V3 = V3') under quasi-steady-state conditions, according to the above scheme. Parallel reactions 3 (second, parenthesized variant) and 3' regenerate hydrogen atoms. It is assumed [9,10] that the hydrotetraoxyl radical НО.4 (first reported in [26-28]) resulting from endothermic reaction 4, which is responsible for the peak in the experimental rate curve (Figure 1, curve 3), is closed into a five-membered [ОО─Н···ОО]• cycle due to weak intramolecular hydrogen bonding [29,30]. This structure imparts additional stability to this radical and makes it least reactive. The НО.4 radical was discovered by Staehelin et al., in a pulsed radiolysis study of ozone degradation in water; its UV spectrum with an absorption maximum at 260 nm (∈НО.4280nm = 320 ±15 m2 mol-1) was reported . The spectrum of the radical is similar to that of ozone, but the molar absorption coefficient (∈НО.4λmax of the former is almost two times larger . The assumption about the cyclic structure of the radical can stem from the fact that its mean lifetime in water at 294 K, which is (3.6 ± 0.4) × 10-5 s (as estimated  from the value of 1/k for the monomolecular decay reaction НО.4→Ho.2+O2 ), is 3.9 times longer than that of the linear radical [16,32] estimated in the same way  for the same conditions , (9.1 ± 0.9) × 10-6 s.
MP2/6-311++G** calculations using the Gaussian-98 program confirmed that the cyclic structure of НО.4  is energetically more favorable than the helical structure  (the difference in energy is 4.8-7.3 kJ mol-1, depending on the computational method and the basis set).2 For example, with the MP2(full)/6-31G(d) method, the difference between the full energies of the cyclic and acyclic НО.4 conformers with their Zero-point Energies (ZPE) values taken into account (which reduces the energy difference by 1.1 kJ mol-1) is -5.1 kJ mol-1 and the entropy of the acyclic-to-cyclic НО.4 transition is ΔS0298 = -1.6 kJ mol-1 K-1. Therefore, under standard conditions, НО.4 can exist in both forms, but the cyclic structure is obviously dominant (87%, Keq = 6.5) . Reaction 4 and, to a much lesser degree, reaction 6 inhibit the chain process, because they lead to inefficient consumption of its main participants -Ho.2 and Н•. When there is no excess hydrogen in the hydrogen-oxygen system, the homomolecular dimer O4 [19-22,40,41], which exists at low concentrations (depending on the pressure and temperature) in equilibrium with O2 , can directly capture the Н• atom to yield the heteronuclear cluster3 НО.4. This НО.4 cluster is more stable than O4  and cannot abstract a hydrogen atom from the hydrogen molecule. Therefore, in this case, nonchain hydrogen oxidation will occur to give molecular oxidation products via the disproportionation of free radicals. The НО.4 radical can disappear via disproportionation with a molecule, free radical, or atom in addition to dissociation. Note that emission from О2(a1Δg) and О2(b1∑+g) is observed at altitudes of 30-80 and 40-130 km, respectively . Staehelin et al.,  pointed out that, in natural systems in which the concentrations of intermediates are often very low, kinetic chains in chain reactions can be very long in the absence of scavengers since the rates of the chain termination reactions decrease with decreasing concentrations of the intermediates according to a quadratic law, whereas the rates of the chain propagation reactions decrease according to a linear law. The kinetic description of the noncatalytic oxidation of hydrogen, including in an inert medium , in terms of the simplified scheme of free-radical nonbranched-chain reactions (Scheme), which considers only quadratic-law chain to unsteady-state critical regimes, and at a substantial excess of the hydrogen concentration over the oxygen concentration was obtained by means of quasi-steady-state treatment, as in the previous studies on the kinetics of the branched-chain free-radical oxidation of hydrogen , even though the applicability of this method in the latter case under unsteady states conditions was insufficiently substantiated. The method was used with the following condition 4 for the ﬁrst stages of the process: k6=√2K52K7  and, hence, V1 = V5 + 2V6 + V7 = (√2K5 [Н•] +√2K7 [НО.4])2 which allow the exponent of the 2k5[Н•]2 term in the d[Н•]/dt = 0 equation to be reduced to 1 [1,46]. The kinetic equations were derived for the rates (mol dm-3 s-1) of the elementary reactions for the formation of molecular products of hydrogen oxidation. The kinetic equations were derived for the rates (mol dm-3 s-1) of the elementary reactions for the formation of molecular products of hydrogen oxidation. The rate constant 2k5 in the case of the pulsed radiolysis of ammonia-oxygen (+ argon) gaseous mixtures at a total pressure of 105 Pa and a temperature of 349 K was calculated to be 1.6 × 108 dm3 mol-1 s-1  (a similar value of this constant for the gas phase was reported in an earlier publication ). 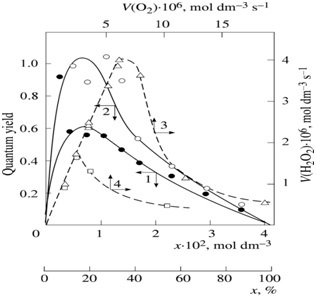 Pagsberg et al.,  found that the dependence of the yield of the intermediate НО• on the oxygen concentration has a maximum close to 5 × 10-4 mol dm-3. In the computer simulation of the process, they considered the strongly exothermic reaction Ho.2 + NН3 → Н2О + •NНОН, which is similar to reaction 3 in Scheme, whereas the competing reaction 4 was not taken into account. The ratio of the rates of the competing reactions is V3/V4 = αl/x and the chain length is ν = V3/V1. equation (1a) was obtained by substitution of the rate constant k2 into equation (1) with its analytical expression (in order to reduce the number of unknown parameters that are to be measured directly). The optimum concentration xm of oxygen, at which the rate of oxidation is maximum, can be calculated from equation (1a) or the analytical expression for k2 if other parameters that appear in these expressions are known. The above data concerning the competition kinetics of the nonbranched-chain addition of hydrogen atoms to the multiple bonds of the oxygen molecules make it possible to describe, using rate equations (1a) and (4a), obtained by quasi-steady-state treatment, the peaking experimental dependences of the formation rates of molecular 1:1 adduct H2O2 on the concentration of the oxygen over the entire range of its variation in binary system (Figure 2). In such reaction systems consisting of saturated and unsaturated components [50,51], the unsaturated compound (in this case the O2) is both a reactant and an autoinhibitor, specifically, a source of low-reactive free radicals (in this case the НО.4 radicals) shortening kinetic chains. The progressive inhibition of the nonbranched-chain processes, which takes place as the concentration of the unsaturated compound is raised (after the maximum process rate is reached), can be an element of the self-regulation of the natural processes that returns them to the stable steady state. Using mechanism of the nonbranched-chain free-radical hydrogen oxidation considered here, it has been demonstrated that, in the Earth’s upper atmosphere, the decomposition of O3 in its reaction with the НО• radical can occur via the addition of the latter to the ozone molecule, yielding the radical, which is capable of efficiently absorbing UV radiation . 1. There were calculations for the two conformers (cis and trans) of the HO4• radical  using large scale ab initio methods and density functional techniques with extended basis sets. Both conformers have a nearly planar geometry with respect to the four oxygen atoms and present an unusually long central O-O bond. The most stable conformer of HO4• radical is the cis one, which is computed to be endothermic with respect to HO2• (X2A") + O2 (X3∑-g) at 0 K.
1. Taking into account the principle of detailed balance for the various pathways of formation of products, whose numbers in the elementary reaction should not exceed three for possible involvement in the triple collisions in the case of the reverse reaction, since the probability of simultaneous interaction of four particles is negligible. 2.The planar, six-atom, cyclic, hydrogen-bonded dimer (HO2•)2 was calculated using quantum chemical methods (B3LYP density functional theory) . The hydrogen bond energy is 47.7 and 49.4 kJ mol-1 at 298 K for the triplet and singlet states of the dimer, respectively. 4.For example, the ratio of the rate constants of the bimolecular disproportionation and dimerization of free radicals at room temperature is k(HO• + HO2•)/[2k(2HO•)2k(2HO2•)]0.5 = 2.8 in the atmosphere  and k(H• + HO•)/[2k(2H•)2k(2HO•)]0.5 = 1.5 in water . These values that are fairly close to unity. 5.This equation can be used to describe a wide range of nonbranched-chain reactions of addition of any free radicals to the C=C bonds of unsaturated hydrocarbons, alcohols, etc., which result in the formation of molecular 1:1 adducts in binary reaction systems of saturated and unsaturated components [1,9,10]. 6.Note that in the case of similar nonbranched-chain (i.e., "slow") oxidation of RH hydrocarbons, the corresponding reactive RO2• and low-reactive RO4• radicals participate in the process . The only difference between the kinetic model of oxidation and the kinetic model of the chain addition of 1-hydroxyalkyl radicals to the free (unsolvated) form of formaldehyde in nonmethanolic alcohol-formaldehyde systems [1, 9, 10] is that in the former does not include the formation of the molecular 1:1 adduct via reaction 4.
i.According to Francisco and Williams , the enthalpy of formation (ΔНf˚298) in the gas phase of Н•, НО•, HO2•, HO4• (the latter without the possible intramolecular hydrogen bond taken into account), О3, Н2О , Н2О2, and Н2О4 is 218.0 ± 0.0, 39.0 ± 1.2, 12.6 ± 1.7, 122.6 ± 13.7, 143.1 ± 1.7, -241.8 ± 0.0, -136.0 ± 0, and -26.0 ± 9 kJ mol-1, respectively. Calculations for the HO4• radical with a helical structure were carried out using the G2(MP2) method . The stabilization energies of HO2•, HO4• and HO3• were calculated in the same work to be 64.5 ± 0.1, 69.5 ± 0.8, and 88.5 ± 0.8 kJ mol-1, respectively. The types of the O4 molecular dimers, their IR spectra, and higher oxygen oligomers were reported [17,18]. The structure and IR spectrum of the hypothetical cyclotetraoxygen molecule O4, a species with a high energy density, were calculated by the CCSD method, and its enthalpy of formation was estimated . The photochemical properties of O4 and the van der Waals nature of the О2-О2 bond were investigated [20,21]. The most stable geometry of the dimer is two O2 molecules parallel to one another. The O4 molecule was identified by NR Mass Spectrometry . Silaev MM, Bugaenko LT (1992) Mathematical simulation of the kinetics of radiation induced hydroxyalkylation of aliphatic saturated alcohols. International Journal of Radiation Applications and Instrumentation. Part C. Radiation Physics and Chemistry 40: 1-10. Silaev (2002) Applied Aspects of the γ-Radiolysis of C1-C4 Alcohols and Binary Mixtures on Their Basis. High Energy Chemistry 36: 70-75. Pikaev AK (1986) Sovremennaya radiatsionnaya khimiya. Radioliz gazov i zhidkostei (Modern Radiation Chemistry: Radiolysis of Gases and Liquids), Nauka, Moscow. Smith HA, Napravnik A (1940) The Photochemical Oxidation of Hydrogen. Journal of the American Chemistry Society 62: 385-393. Badin EJ (1948) The Reaction between Atomic Hydrogen and Molecular Oxygen at Low Pressures. Surface Effects. Journal of the American Chemistry Society 70: 3651-3655. Pagsberg PB, Eriksen J, Christensen HC (1979) Pulse radiolysis of gaseous ammonia-oxygen mixtures. J Phys Chem 83: 582-590. Barr NF, Allen AO (1959) Hydrogen Atoms in the Radiolysis of Water. J Phys Chem 63: 928-931. Silaev MM (2001) [New kinetic model of the radical-chain oxidation, including competitive reactions: Oxygen as an autoinhibitor]. Biofizika 46: 203-209. Silaev MM (1999) The Competition Kinetics of Radical-Chain Addition. Russian Journal of Physical Chemistry 73: 1050-1054. Silaev MM (2003) Competitive Mechanism of the Nonbranched Radical Chain Oxidation of Hydrogen Involving the Free Cyclohydrotetraoxyl Radical [ОО···Н···ОО]•, which Inhibits the Chain Process. High Energy Chemistry 37: 24-28. Silaev MM (2007) Simulation of the initiated addition of hydrocarbon free radicals and hydrogen atoms to oxygen via a nonbranched chain mechanism. Theoretical Foundation of Chemical Engineering 41: 831. Silaev MM (2008) Simulation of initiated nonbranched chain oxidation of hydrogen: Oxygen as an autoinhibitor. High Energy Chemistry 42: 95-100. Francisco JS, Williams IH (1988) The thermochemistry of polyoxides and polyoxy radicals. International Journal of Chemical Kinetics 20: 455-466. McKay DJ, Wright JS (1998) How Long Can You Make an Oxygen Chain? Journal of the American Chemistry Society 120: 1003-1013. Lipikhin NP (1975) The Oxygen Dimers, Clusters, and Cluster Ions in the Gas Phase. Russian Chemical Reviews 44. Razumovskii SD (1979) Kislorod – elementarnye formy i svoistva (Oxygen: Elementary Forms and Properties), Khimiya, Moscow. Dunn KM (1990) The infrared spectrum of cyclotetraoxygen, O4: A theoretical investigation employing the single and double excitation coupled cluster method. J Chem Phys 92: 6077. Brown L, Vaida V (1996) Photoreactivity of Oxygen Dimers in the Ultraviolet. The Journal of Physical Chemistry 100: 7849-7853. Aquilanti V, Ascenzi D, Bartolomei M, Cappelletti D, Cavalli S, et al. (1999) Molecular Beam Scattering of Aligned Oxygen Molecules. The Nature of the Bond in the O2-O2 Dimer. Journal of the American Chemistry Society 121: 10794-10802. Cacace F, de Petris G, Troiani A (2001) Experimental Detection of Tetraoxygen. Angew Chem Int Ed Engl 40: 4062-4065. Taylor HS (1926) Photosensitisation and the mechanism of chemical reactions. Transactions of the Faraday Society 21: 560-568. Foner SN, Hudson RL (1962) Mass Spectrometry of the HO2Free Radical. J Phys Chem 36: 2681. Lightfoot PD, Veyret B, Lesclaux R (1990) Flash photolysis study of the methylperoxy + methylperoxy reaction: rate constants and branching ratios from 248 to 573 K. J Phys Chem 94: 700-707. Smith P(1954) The HO3 and HO4 Free Radicals. Chemistry and Industry 42: 1299-1300. Robertson AJB (1954) A Mass Spectral Search for H2O4 and HO4 in a Gaseous Mixture Containing HO2 and O2. Chemistry and Industry 48: 1485. Bahnemann D, Hart EJ (1982) Rate constants of the reaction of the hydrated electron and hydroxyl radical with ozone in aqueous solution. J Phys Chem 86: 252-255. Pimentel GC, McClellan AL (1960) The Hydrogen Bond. University of California, Berkeley, USA. Pg no. 475. Svyaz V, Statei S (1981) The Hydrogen Bonding: Collection of Articles Nauka, Moscow, Russia. Staehelin J, Bühler RE, Hoigné J (1984) Ozone decomposition in water studied by pulse radiolysis. 2. Hydroxyl and hydrogen tetroxide (HO4) as chain intermediates. J Phys Chem 88: 5999-6004. Cacace F, de Petris G, Pepi F, Troiani A (1999) Experimental Detection of Hydrogen Trioxide. Science 285: 81-82. Bühler RF, Staehelin J, Hoigné J (1984) Ozone decomposition in water studied by pulse radiolysis. 1. Perhydroxyl (HO2)/hyperoxide (O2-) and HO3/O3- as intermediates. J Phys Chem 88: 2560-2564. Trushkov IV, Silaev MM, Chuvylkin ND (2009) Acyclic and cyclic forms of the radicals HO4• CH3O4• and C2H5O4•: ab initio quantum chemical calculations. Russian Chemical Bulletin 58: 489-492. Wong W, Davis DD (1974) A flash photolysis‐resonance fluorescence study of the reaction of atomic hydrogen with molecular oxygen H + O2 + M → HO2 + M. International Journal of Chemical Kinetics 6: 401-416. Benson SW (1976) Thermochemical Kinetics: methods for the estimation of thermochemical data and rate parameters (2nd edn). Wiley, New York, Pg no: 320. Mansergas A, Anglada JM, Olivella S, Ruiz-López MF, Martins-Costa M (2007) On the nature of the unusually long OO bond in HO3 and HO4 radicals. Physical Chemistry Chemical Physics 9: 5865-5873. Yagodovskaya TV, Nekrasov LI (1977) Use of Infrared Spectroscopy to Study Frozen Hydrogen–Oxygen Systems Containing Hydrogen Polyoxides. Zhurnal Fizicheskoi Khimii 51: 2434-2445. Xu X, Muller RP, Goddard III WA (2002) The gas phase reaction of singlet dioxygen with water: A water-catalyzed mechanism. Proc Natl Acad Sci U S A 99: 3376-3381. Seidl ET, Schaefer III HF (1992) Is there a transition state for the unimolecular dissociation of cyclotetraoxygen (O4)? The Journal of Chemical Physics 96: 1176-1182. Hernández-Lamoneda R, Ramírez-Solís A (2000) Reactivity and Electronic States of O4 along Minimum Energy Paths. The Journal of Chemical Physics 113: 4139-4145. Varandas AJC, Zhang L (2000) Test studies on the potential energy surface and rate constant for the OH + O3 atmospheric reaction. Chemical Physics Letters 31: 474-482. “Atmosfera. Spravochnik” (1991) (“Atmosphere: A Handbook”), Gidrometeoizdat, Leningrad. H. Okabe (1978) Photochemistry of Small Molecules, Wiley, New York. Nalbandyan AB, Voevodskii VV (1949) Mekhanizm okisleniya i goreniya vodoroda (“Mechanism of Hydrogen Oxidation and Combustion”), V. N. Kondrat'ev, Editor, Akad. Nauk SSSR, Moscow. Bateman L (1954) Olefin oxidation. Q Rev Chem Soc 8: 147-167. Boyd AW, Willis C, Miller OA (1971) A Re-examiation of the Yields in the High Dose Rate Radiolysis of Gaseous Ammonia. Canadian Journal of Chemistry 49: 2283-2289. Silaev MM (2000) Competition Mechanism of Substrate-Inhibited Radical Chain Addition to Double Bond. Petroleum Chemistry 40: 29-35. Silaev MM (2015) Mathematical Simulation of Kinetics of Radiation-Induced Free-Radical Oxidation by Nonbranched-Chain Mechanism. Recent Innovations in Chemical Engineering 8: 112-124. Silaev MM (2005) [Low-reactive Free Radicals Inhibiting Nonbranched Chain Processes of Addition]. Biofizika 50: 558-600. Silaev MM (2017) Kinetics of the Free-Radical Nonbranched-Chain Addition. American Journal of Polymer Science and Technology 3: 29-49. Figure 1: (1, 2) Quantum yields of (1, ●) hydrogen peroxide and (2, ○) water resulting from the photochemical oxidation of hydrogen in the hydrogen-oxygen system as a function of the oxygen concentration x (light wavelength of 171.9-172.5 nm, total pressure of 105 Pa, room temperature ). (3, 4) Hydrogen peroxide formation rate V(Н2О2) (dashed curves) as a function of the rate V(О2) at which molecular oxygen is passed through a gas-discharge tube filled with (3, Δ) atomic and (4, □) molecular hydrogen. Atomic hydrogen was obtained from molecular hydrogen in the gas-discharge tube before the measurements (total pressure of 25-77 Pa, temperature of 77 K ). The symbols represent experimental data. 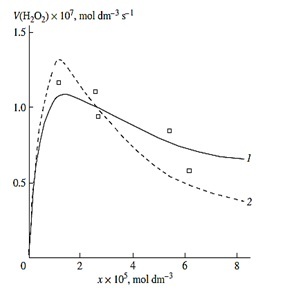 Figure 2:(1, ) Reconstruction of the functional dependence of the total hydrogen peroxide formation rate V3, 7 (Н2О2) on the dissolved oxygen concentration x from empirical data (symbols) using equation (1a) and (4a) (model optimization with respect to the parameter α) for the γ-radiolysis of water saturated with hydrogen and containing different amounts of oxygen at 296 K  (SY = 1.13' 10-8). (2) The dashed curve described V3(H2O2) as a function of the oxygen concentration x based on equation (1a) (model optimization with respect to α) and the experimental data of curve 2 (SY = 1.73´ 10-8). 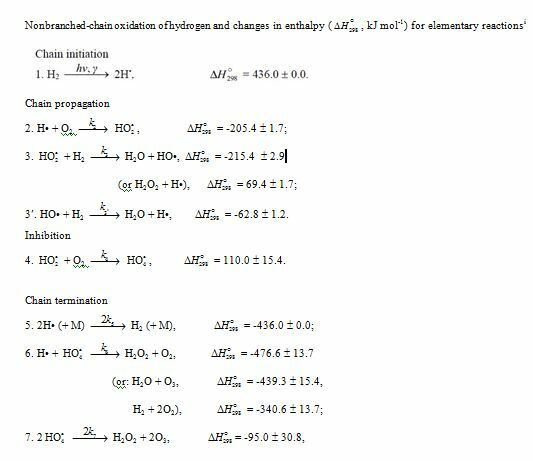 Citation: Silaev MM (2018) Hydrogen Oxidation: Kinetics of Free-Radical Nonbranched-Chain Addition of Hydrogen Atom to Oxygen Molecule. J Mod Chem Sci 1: 003. Copyright: © 2018 Silaev MM. This is an open-access article distributed under the terms of the Creative Commons Attribution License, which permits unrestricted use, distribution, and reproduction in any medium, provided the original author and source are credited.